Today I am talking about buying beads that come in various sizes on one strand. You must be able to calculate price per bead while standing in a shop. Horrors! Math is my worst nightmare. I eyeball a strand and do the right thing…I negotiate. If I am able to buy for my price, I’m happy. Somehow, I just know I bought well. Now I have this strand as you can see in my photo. It shows the various sizes on the strand. 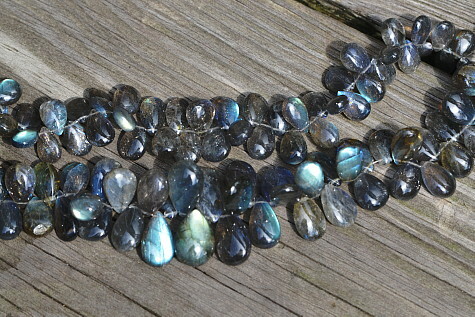 This stone is called Labradorite. Bead count tells me price per bead. I can handle this. We won’t talk about that…I still use my fingers for counting. Now sizes have to be matched up. If you plan on making a piece of jewelry where beads are graduated, you want from center (then left and right) up to clasp, identical size stones each side. Earrings are a perfect example of stones having to be identical size. For beginners, this is a good way to start. I find I am always matching stone sizes, even now. Helter Skelter, mixing sizes comes later. I learned after a few months to buy more then one strand of the same beads. Three strands maximize the usage for pairing up. Pairs go into small bags or I restring the strand with the match pairs for future use. Quality. A tray full of what type of bead I am looking for is shown. I look for best color, no chips and all around perfect strands. It’s essential in my jewelry. There is a lot of effort behind that one piece. I love it! For me it’s exciting.